Pork Dinakdakan is a dish involving a part of the pig which is referred to as maskara (or mask). It pertains to the face of the pig. The maskara is boiled until tender, chopped, and mixed with other ingredients. This is popular in the Northern parts of the Philippines. Dinakdakan is considered as a beer food, this means that it is served along with beer and liquor. Adding liver is recommended when making this dish. I posted a recipe for dinakdakan over at Panlasangpinoy.com that involves the use of pork liver . The result was really good. I tried a different approach for this recipe by using chicken liver. This is an ingredient that I use to make a famous Filipino dish called “Sisig”. I think that using chicken liver is a better idea because it has a tendency to crumble right after grilling. Crumbled chicken liver blends well with all the ingredients easily and quickly resulting to a tastier dish. I like my pork dinakdakan spicy. This was the reason why I had both Thai chili and Jalapeno pepper in it. You don’t need to add as much (or as little) spice in it. Adjust the spice of your dish according to your preference. Let me quickly share to you what I do when I want to up this dish to the next level. 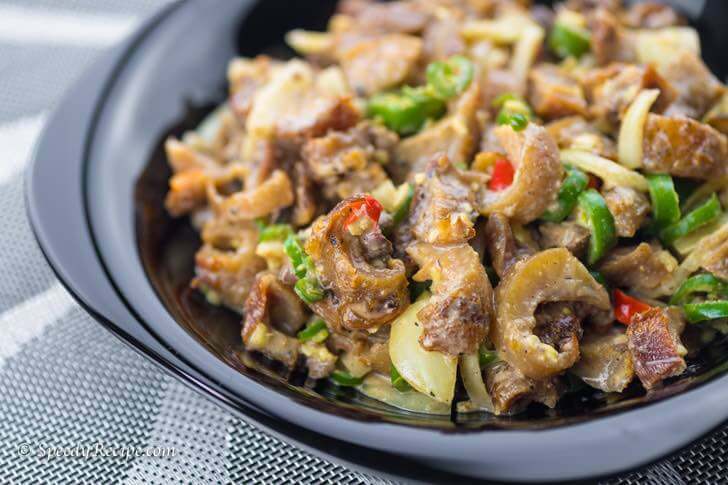 I simply add chopped “inihaw na liempo” (grilled pork belly) into my dish and toss it one more time. Enjoy this yummy Filipino pulutan recipe. Cheers! This is a recipe for Pork Dinakdakan. Add the maskara. Cover the pot and continue to boil until it gets tender. Remove the maskara from the pot and discard the water. Coat the maskara with soy souce by pouring it over and rub. Let it stay for 5 minutes. Heat-up the grill. Start to grill the maskara for 3 to 5 minutes per side. At the same time, arrange a greased aluminum foil over the grill and put the chicken liver on it. Grill each side for 5 minutes. Remove the maskara and chicken liver from the grill. Let it cool down. Chop and then Set aside. On a large mixing bowl, combine vinegar, mayonnaise, sugar, ground black pepper, and salt. Mix well. Add the onion, Thai chili, Jalapeno pepper, ginger, maskara, and chicken liver. Toss until all the ingredients are well blended. Tranfer to a serving bowl. This can be served immediately or kept in the fridge to be served chilled later on. Love this site… Ang daming recipes ng mga gusto kong pagkain..